Ace of Swords Tarot Card Meaning - All Explained HERE! 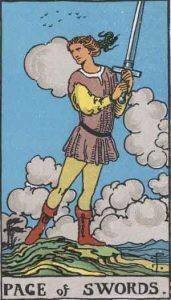 The Ace of Swords is the first card in the suit of Swords. All aces can mean a new start. Like a sword, the actions that bring forth this new change can act quickly and without warning. Aces regularly represent a new beginning, coupled with Swords, this suggests a new personal goal or worldview. You may see yourself coming out of your shell soon. The Ace of Swords represents achievement, victory, and focus. Past – The Ace of Swords in the Past position can represent a past event when you planned ahead and acted quickly. It probably has some effect on your life now, and you’re seeing the effects of researching everything and acting when the time was right. For example, you may have noticed trends and acted at the right time. Following your instinct has led you to where you are now. Others may have thought you were quick on the ball to adapt to a new trend, and it’s worked in your favour. Present – The Ace of Swords in the present position can be interpreted from it’s past position. You’re currently in a period of change, or you’re just about to head into a sudden, unexpected change which will affect you personally. It may possibly be violent, but if you’re the one causing the violence or stress, you need to calm down. Acting rashly isn’t always a bad thing, but make sure it’s you who is controlling your actions, and not your emotions. Think things through and then act. You don’t go off to war without preparing. Future – The Ace of Swords in the future position can suggest a strong potential outcome, a life you are happy with if you’re willing to work for it. It isn’t about earning money, it’s about reaching your potential, especially in a creative field. Don’t rush into any schemes, but read about them. Learn as much as you can and act upon the information. The Ace of Swords regarding the future can represent a fun, active lifestyle, especially one where you’re constantly challenging and pushing yourself with new experiences. Work / Education – The Ace of Swords in regards to work or education is a positive sign, especially regarding a potential new job or positive reshuffle in your current job. In all aspects; look outside boundaries you’ve set yourself. Just remember, it can’t hurt to apply for something you don’t think you’re qualified for, nor can it hurt to try a completely different field of work to what you’re used to. Romance – The Ace of Swords in romance is a very good sign, especially if you are single. The whole card is about new beginnings, so expect a change in this aspect of your life. For a partner, you might run into somebody spontaneous, who is adventurous and a lot of fun to be around. If you’re in a relationship, you might be feeling the need to spice things up. It can be exciting to introduce a new aspect to your relationship, though make sure all involved are comfortable with the additions. The Ace represents beginnings, if you wish to share deeper feelings with your partner, now might be the time. You’ll develop your relationship into another level as a result. Friends – The Ace of Swords in regards to friendship can signify underlying conflict with your friends. Try to settle things. It may be that there’s been something laying dormant for a while and you’re just going to need to bite the bullet and either press for an answer or confess. The biggest regret you can have is not acting in this case. Money – The Ace of Swords in regards to finances is a mixed sign. Have a safety net when it comes to money. You never think it, but unexpected things can and do happen. Prior preparation prevents piss poor performance. The Ace, and Swords especially as a suit, can represent swift change. Be sure to know your limits, and don’t fall for any fallacies when it comes to money. Sometimes you can win by cutting your losses earlier than you usually do. Health – The Ace of Swords is reminds you of your mortality in a way. Now is a good time to turn over a new leaf. New beginnings. Unexpected things that recently may have happened to somebody you know should reinforce the sort of lifestyle you wish to lead. Spirituality and Mentality – Things aren’t set in stone, especially swords. Everything is fluid and relative. Explore other viewpoints. What do you believe now? Spend some time looking into the contrary and you’ll open up doors for your mind. It’s a good time to consider different viewpoints. It’s likely that you’ve been feeling stuck in a rut, life may just be starting to feel a little too mundane for your liking right now. You’re getting too familiar with life and desire something new and exciting to happen. The good news is that all you need to change is your perception, but experiencing something new is as simple as pushing yourself to go out there and do it. Don’t get bogged down with illusions about life and experiences, you should go and see things with your own eyes. 1 represents the beginning, creation and initial ideas. All aces symbolise this. The Ace of Swords strongly shows that an awesome event is going to happen in your life soon. This may be good, it could be bad; there is likely to be some conflict to resolve. If you have many Aces in a reading, it is a strong indication that you are at the start of a new part of your life; for better or worse. The following tarot readers from Kasamba have been rigorously scrutinized and tested. We can confirm that they are REAL Tarot Readers who will offer accurate predictions and detailed answers for you. Select one of them below and get a free live tarot reading with a FREE 3 minutes chat + 50% discount! We’ve selected live tarot readers to give you a FREE 3 Minute interpretation of The Ace of Swords! Scroll through them below and pick your favorite one.